Looking for twelve Host Families for the 2019-2020 school year to place international students in homes around the state of Idaho. To be a Host Family is to agree to welcome a high school foreign exchange student into your home, to live as part of your family while they attend your local high school, for anywhere from a few weeks to 10 months! At Pan Atlantic Foundation, we guide and support you through this process from start to finish! 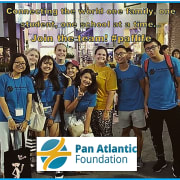 Every student is also a part of the Pan Atlantic family and they, and you, have access to an Area Representative who is there to support you and your student throughout the entire experience! They will be in contact with you, at least once a month, but are available any time you have questions. Work closely with your Area Representative to select the perfect student for your family. Single, a senior or an LGBT couple? All are welcome to host a student. In fact, host two! Each Pan Atlantic Foundation student completes a community-service project. Pan Atlantic Foundation students and host families can participate in fun events, like photo and video contests.